St. Anthony of Padua is regarded as one of the greatest preachers in the order. 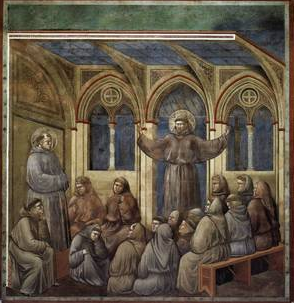 Arguably the oldest and most “authentic” Franciscan ministry, the Ministry of the Word is an effective way that friars have reached the people where they are for 800 years. Today, it takes the form of a Parish Mission, in which friars travel from church to church preaching at mass, offering time for penance, and organizing a series of evening lectures on a given topic. When done well, inspiring preachers can be the spark that revives a congregation in faith and action, while being the replacement necessary for overworked pastors to take an overdue spiritual retreat. From Saturday until Wednesday, the other postulants and I got some first hand experience of the workings of such a ministry. Instead of simply supporting our director (Fr. Ron) with our presence and prayers, we were actually given the responsibility of coordinating a significant portion of the events: each of us took part in speaking at the Sunday masses to advertise while Dennis and Ramon spoke three different times to the various youth groups, Edgardo gave the homily at the Spanish mass and coordinated a Spanish mission night, and Sergio and I took turns emceeing for Fr. Ron and each gave ten minute talks of our own. How did we do, you ask? In terms of our programming, preaching, and message, I think we did a good job. People left with a little more joy, were a little more forgiven, and were hopefully a little more inspired for the life of the Church than when they started. By those standards, I’d say we did fairly well. But because we’re Franciscan friars, there’s always more to it than the message itself: our witness to fraternal life. Though our programming, preaching, and message may be exactly the same as secular priests, Ph.D.’s, and most other forms of speakers, it is our ability to flow from and witness to fraternal life that sets us apart, and therefore should be the standard by which we judge ourselves. By those standards, I’d say we passed with flying colors. Because we took the time to work together (even though it might have been more efficient to work alone), and were present and visible to our brothers when they were speaking (even though we probably could have just as easily stayed home and gotten something done), our actions were much more effective forms of evangelization than our words ever could have been. Even though Ron did the majority of the speaking, his visible relationship to us forced the congregation to recognize a collective presence, not just Ron’s. Thus, when they heard the message, whatever it was, and whoever was speaking it, I got the feeling that they heard it as our message, not just one’s own. Because we had made it so apparent to them that fraternity is the core from which we minister, I believe that they saw us as one unified entity rather than a collection of individuals. If that is truly the case, then it is “mission” accomplished. After having experienced a parish mission first hand, I think it’s certainly possible to be more efficient in programming, preaching, and orchestrating a coherent message when working alone (not too mention much easier); but in terms of effectiveness, friars working together will always triumph because of their inherent ability to witness to the fruits of fraternal life. It is this witness that gives me the life and inspiration to continue in my journey as a friar in training, and gives me great hope for a future with my brothers. I am sure it was a wonderful mission! It would be wonderful if you could come back to St. A’s and do one. Mike and I have been teaching Weds. night Religious Ed. to high schoolers. It has been so inspiring to see and feel their spiritual growth. Any suggestions? Take care, and God Bless.